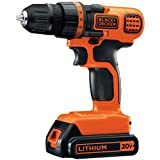 Black Friday/Cyber Monday 2018: Drill, Power Tools Deals, Discount live!! Drill and Power tools are essential for any home to handle simple tasks around the house. If you need a drill, an impact driver kit this Black Friday/Cyber Monday 2018 is the best time around the year. 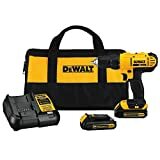 A lot of premium tool kits from authentic brands such as Dewalt, Bosch, Black, and Decker offer a lot of huge discounts up to 41% and extra coupon. Among all the deals, we have spotted 4 options with deepest discounts that you might consider. 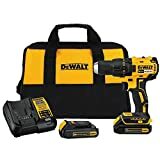 DEWALT DCD777C2 20V Max Lithium-Ion Brushless Compact Drill Driver – this model is the most popular drill driver model from Dewalt with thousands of positive feedback for its value. Dewalt DCD777C2 uses a brushless motor for longer lifetime, built-in LED lights with 20-second delay for accurate drilling, ergonomic T-shaped handle, no load speed (0-1600 rpm), powerful torque (340 UWO) and super lightweight. If you are looking for a drill/compact driver for doing around the home or DIY projects, Dewalt DCD777C2 is a perfect option. Currently, this unit is available with 41% discount and we think it is the best price for the whole shopping holiday. Dewalt DCD771C2 20V MAX Cordless Lithium-Ion 1/2 inch Compact Drill – this model is another option you might consider. It is compact, lightweight, powerful torque (300 UWO), and it has 2 speeds (0 – 450, 450-1500 rpm) so that you can handle a variety of drilling/ screwing jobs. This unit is currently available with 41% off. BLACK+DECKER LDX120C 20V MAX Lithium Ion Drill / Driver – this model is the best option if you are finding a low price drill for daily jobs. It is ideal for drilling into wood, metal plastic and all screw driving tasks. Currently, this model is available with 41% discount, making it the cheapest drill option you can rely on. 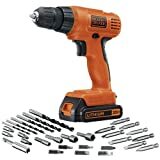 BLACK+DECKER LD120VA 20-Volt Max Drill/Driver with 30 Accessories is a low cost option for drilling around the house. It has a full set of 30 accessories and single speed (0 -650 rpm). This unit is currently available with 52% off. At the moment, we have tracked a lot of brands offer deep discounts for many models. We also discuss the benefits of each deal for you to have a better understanding before making a purchase. You should notice that the percent discounts are accurate by the published time and we are trying to update regularly, but the can be adjusted by the manufacturers anytime. You should check for the price of any deal before buying. Dewalt – During Black Friday 2018, Dewalt offers up to 41% off many drill models. Some premium drill sets remain the same price. As Dewalt drill are very favorable, they can be out of stock sooner than expected. If you are searching for a Dewalt drill tool, it is a good time to make purchase now. Black + Decker – The brand offers up to 52% discounts on selected models. Similar to Dewalt, Black + Decker drills are fond of thousands buyers, you should notice the stock number of the deals to avoid missing them. Bosch – The brand offers up to 25% discounts on selected models. Because Bosch drills are quite expensive, 25% off means a lot of money you can save off. Bosch drills are stocked with a high quantities, therefore if you are about to choose this brand, you can keep watching the discounts and deals to get the better one. With a light-duty drill, you can use it for drilling holes around the house. For instance, installing a drapery bracket, making holes for hanging pictures, cabinet handles or door hinges can be done easily with a light-duty drill. The best design for a light-duty drill is a cordless design (using battery). It is lightweight and allows you to do quicker. You should look for models with at least 2-speed options if you need to do a lot of drilling and driving screw. An adjustable clutch will be a plus point. For the light-duty use, you do not really need a model with high voltage, stay around 6V-10V is sufficient. A medium-duty drill is a good option if you need to drill a bigger hole on hardwood, plywood, and drywall. It is suitable for DIY workers who build bookshelves, furniture, and others. The best drill for medium-duty jobs should have variable speed controls (often it has 2-speed ranges), a clutch and cordless drill is a better option, even though you might want to have a corded design for continuous working. For the medium-duty cordless drill, pick the one with higher Voltage for more power. Often a cordless model with 10-12V is the perfect range. If you have to drill holes for timber, thick walls, masonry walls, timbers, metals, a heavy-duty drill is the most suitable option. It is suitable for construction workers, workshops, DIY workers where a professional-grade drilling machine is mandatory. You will have full-package benefits from a heavy duty drill such as variable speed controls, a full set of accessories, LED lights and a plenty of power. If you pick a cordless option, an 18-20V model will be the best choice. Dewalt is an authentic brand for many years. Especially, Dewalt has a lot of deep discounts on Black Friday 2018. Some models are discounted up to 40% therefore it is the best chance to get a dewalt power drill during Black Friday event. Dewalt DCD771C2 is number one option of power drill drivers. This model is currently discounted up to 40%. This unit is suitable for drilling around the house. It is a cordless unit and very lightweight( only 3.64 lbs). You can adjust the drilling speed (2 speed modes: 450 rpm and 1500 rpm) for different drilling and fastening jobs. Dewalt DCD771C2 uses a Li-ion battery and it hold great charges over weeks. Currently this model is discounted up to 41%, and it is the first recommend when you are looking for a lightweight, compact powered drills therefore this unit is the best deal from Dewalt so far. DEWALT DCD777C2 is another option you might consider. This unit is also currently discounted up to 40%. DEWALT DCD777C2 delivers similar performance with Dewalt DCD771C2 model. However, it is lighter (only 2.6 lbs) and it uses a brushless motor, so that the motor has a longer runtime. On the other hands, DEWALT DCD777C2 only has no load speed of 1600 rpm, meaning you can not adjust the speed for different fastening or drilling demands. DEWALT DCD777C2 -this model is ultra-lightweight. It is recommended for ladies, users with weak wrists who need a powered tool for drilling simple things. DEWALT DCD777C2 is currently discounted up to 41%. This model deal is time-limited. DEWALT DCF885C1 is designed for super tight areas. This impact driver kit is also discounted. DEWALT DCF885C1 is a great tool for auto repair job. This unit has a lot of power and it is very lightweight and it is very compact. Therefore, you can get it into many tight spots underneath the car. There are 3 LED lights allowing you to have more visibility. Once fully charged, you can use this tool for days before recharging. One handed loading : ¼’’ hex chuck, 1’’ bit tips. DEWALT DCF885C1 is currently available with 41% off discount. DEWALT DCD791D2 is a full option for professionals. It has more torque power, longer run time, higher speed transmission and 2 -speed setting. This unit is suitable for any demanding tasks. Currently, DEWALT DCD791D2 is discounted already. DEWALT DCD791D2 uses a brushless motor to give more run time (57 %). For workshop, garage, this is a great advantage. Unlike DEWALT DCF885C1 , this model uses a brushless motor and XR Li-Ion battery which gives workmanship for tougher tasks. Besides, you can adjust the speeds anywhere from 0-500 rpm and 2,000 rpm. You also need to pay attention to the weight of this model. Since it is a robust tool for professionals, it is kind of a bit more heavy (3.4 lbs.) and it is more expensive than the DEWALT DCF885C1. 57% more run time compared to brushed motor. DEWALT DCD791D2 is currently available with 41% off. BLACK+DECKER BDCD8C is a small drill for light task. If you need nothing other than drilling small holes around the house, then this model is the best option. It is very cheap and its price is discounted so far. This unit is just around 1.3 lbs, charged with a usb charger and it features 3/8″ keyless chuck for quick and easy bit changes. Currently, this model has a small discount with 8% off. BLACK+DECKER BDCDMT120C is a low price option for users who need to do a lot of mixed applications at light- duty level. This model is currently discounted. BLACK+DECKER BDCDMT120C is featured by the 20V MAX system of Black and Decker brand. This mean you can use the main body with different attachment to move from one task to another. Therefore, you do not need to buy separate tools but just the attachments to save the cost up to 42% compared with buying single tools. BLACK+DECKER BDCDMT120C is also a lightweight, compact and cordless model. However, this model does not have strong torque for difficult tasks like Dewalt brand. This unit maximal speed is around 800 rpm only. Therefore, it can handle around 70-80% of household jobs like drilling holes, installing screws, sanding for DIY projects but it is very hard to drill materials like real hardwood, metals or so. On overall, the model is suitable for home use, small woodworking workshop, not for professionals. BLACK+DECKER BDCDD220C is somehow similar to the BLACK+DECKER BDCDMT120C model. It is also compatible to 20V MAX system. This unit is also discounted at this time. BLACK+DECKER BDCDD220C features 2 speeds for light duty and medium duty task. It is 0-360 rpm and 0 – 1400 rpm. Besides, it is very lightweight (2.6 lbs.) and low price. A lot of DIY workers love to have this model more than Dewalt brand to save the cost while still be able to handle a lot of applications. Currently this model is available with 14% off the listing price. Black & Decker Drill/Driver Impact Combo Kit is a fantastic option. Obviously this impact driver is not as powerful as the Dewalt models, but its price and compatibility with other Black and Decker cordless tools make it the best choice for daily tasks around the house. TackLife is a new brand entering powered tool markets. As there is little information of the brand on its website, we do not highly recommend to choose as other authentic brands. The best benefits of Tacklife brand is that their tools are super cheaps (cheaper than Black and Decker) and there are a lot of accessories included in the package. And there is no discount spotted so far. Bosch has been too famous in the industry. Bosch offer premium powered tools with longevity and durability, therefore their machines are quite more expensive on regular days. If you would like to pick high-end models from Bosch brand, Black Friday 2018 perhaps the best time of the year. At the moment there are certain models from the brand that have discounts.